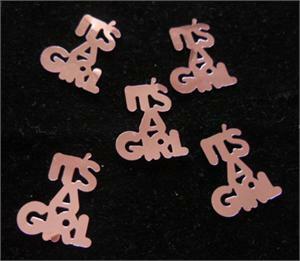 These cute pink "It's a Girl" confetti's used alone or mixed with matching pink Stars of David make party planning fun. 1/2 oz bag. Price is for one bag. If used to sprinkle around centerpieces, one bag does 2 1/2 tables. Can be mixed with Item 1056LtPk shown on the page "Star of David Confetti". Regular price $2.25. 44 bags available.